Headache is a common reason for pediatric patients to seek medical care. Headaches can result from any of a number of causes, including genetic predisposition, trauma, an intracranial mass, a metabolic or vascular disease, or sinusitis. Recognition that pediatric headaches can result from primary and secondary causes is crucial to their treatment. For migraine or tension headache in pediatric patients, a thorough history and physical examination usually suffice. Laboratory, radiologic, or electroencephalographic (EEG) studies are not useful to confirm the diagnosis of migraine but may help exclude other causes of headache. Lumbar puncture may reveal elevated opening pressure, leukocytosis, elevated protein, and low glucose. It is the most sensitive test in the diagnosis of subarachnoid hemorrhage. EEG may be useful to assess the status of an underlying seizure disorder associated with headache or to exclude seizures in children with acute confusional migraines. Trigeminovascular system. The trigeminal nerve fibers around basal cerebral and meningeal vessels are triggered (various stimuli are possible), and a vicious cycle starts in which the nerve terminals release calcitonin gene-related peptide (CGRP), substance P, vasoinhibitory peptide (VIP), and other mediators of local neurogenic inflammation and vasodilatation. The latter further stimulates the nerve endings. 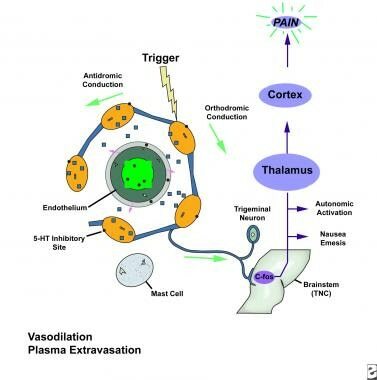 On the other end of the nerve, painful messages are transmitted toward central centers, including thalamus and cortex, and the sensation of pain arises. Modern drugs, such as the triptans, act at 3 levels, via 5-HT 1 B and D receptors; they vasoconstrict the vessels, reduce the release of the above-mentioned mediators, and decrease the central transmission of pain impulses. The most common primary headaches in pediatrics are migraine and tension-type headaches, representing the ends of a spectrum of manifestations of similar pain mechanisms. These 2 types of headache can be episodic, or they can exist in a chronic, daily form (present 15 or more days per month for 3 or more months). Pediatric migraines are often bilateral, and clear localization of the pain can be difficult to obtain from children. Migraines in children are often of shorter duration than they are in adults. Migraine with aura is seen in 14-30% of children with migraine. Migraine variants are headaches that are accompanied or manifested by transient neurologic symptoms. These symptoms may occur immediately before, during, or after the headache. In some situations, the headache may be mild or nonexistent. Tension-type headaches are benign. They manifest as a bandlike sensation around the head, and they may be associated with neck and/or shoulder pain. These headaches often become worse as the day progresses and can last for days. They may be associated with stressful events at home or school, and they may be temporarily and relieved by sleep. In addition, the headache should not be attributed to any other cause. Migraine variants are headaches that are accompanied by or manifested by transient neurologic symptoms. These symptoms may occur immediately before, during, or after the headache. In some situations, the headache may be mild or nonexistent. Hemiplegic migraine and basilar artery migraine are typical examples of migraine with aura. Hemiplegic migraine, while unusual, is seen more commonly in children than in adults. This type of headache is characterized by abrupt onset of hemiparesis, which usually is followed by a headache. Hemianesthesia may also precede the headache. Basilar artery migraines are more common in girls. They are characterized by dizziness, weakness, ataxia, and severe occipital headache (with vomiting). Less common migraine presentations have been described in which head pain is not a prominent feature. The "Alice in Wonderland" syndrome is characterized by distortions of vision, space, and/or time. Patients may note micropsia and/or metamorphopsia, as well as other sensory hallucinations. Confusional migraine seen in juvenile patients is characterized by impairment of sensorium, agitation, and lethargy; these impairments sometimes progress to stupor. Focal neurologic deficits, such as aphasia, anisocoria, and memory deficits, may also be seen. Benign paroxysmal torticollis of infancy is characterized by episodes of a head tilt, and benign paroxysmal vertigo of childhood is characterized by recurrent episodes of vertigo and ataxia. The torticollis typically occurs during the first year, whereas the vertigo occurs in young children (usually aged 2-3 years). Cyclic vomiting and recurrent abdominal pain frequently are considered migraine variants. Before diagnosing either of these entities, primary gastrointestinal (GI) diseases must be excluded. Headache can lead to psychological impairment and decreased quality of life, especially for persons who experience chronic migraine. Children who suffer from migraine are more impaired than children who do not suffer from headaches or even children who suffer from tension-type headache, in terms of medication use, school nurse visits, and school absences. Three million bedridden days per month in the US are attributed to headache, and more than 50% of absentees from headache average at least 2 days of absence per month. For almost 1 million children who have migraine, over 150,000 school days are missed. Because the brain is insensate, headache is due to the stimulation of pain-sensitive nerve fibers in large cerebral arteries and veins, the periosteum of the skull, the muscle and skin of the scalp, the sinus mucosa, the temporomandibular joint, the teeth, or the gingiva. On the other end, pain afferent messages are transmitted centrally. Whether this system is abnormal in migraineurs versus healthy people, and whether it is genetically determined, is not known. Evidence exists of cortical hyperexcitability in migraineurs, which may be linked to a defect in the central catecholaminergic systems. Low magnesium levels also may play a role. White-matter T2 MRI hyperintensities are observed in higher frequency in migraineurs with aura, especially in the posterior circulation territories. The pathophysiologic implication of this remains unclear. Chronic transformation of migraine is believed to be due to spatial and temporal, central and peripheral sensitization, which correlates clinically with cutaneous allodynia. Another mechanism thought to result in migraine headache has its origin in the brain stem. The onset of the aura in migraine headache is thought to be mediated by cortical spreading depression (CSD)—caused by neuronal activation followed by suppression—which spreads over the cortical surface. A simultaneous change occurs in cerebral blood flow, characterized by hyperperfusion, followed by hypoperfusion. CSD is thought to be caused by either trauma or changes in the local concentrations of hydrogen ions, potassium, and glutamate. CSD activates central nervous system (CNS) nociceptors, possibly through the release of nitric oxide, atrionatriuretic factor, activation of noradrenergic pathways, and/or changes in cerebral blood flow. CSD also causes neurogenic inflammation, which stimulates the release of several different neurotransmitters that lead to cerebral vasodilatation and activation of CNS nociceptors. It should be clarified that although true migraine is a primary headache disorder, sometimes a migrainelike headache can be secondary to a metabolic or vascular disease. This is the case, for instance, with MELAS (mitochondrial encephalomyopathy, lactic acidosis, stroke), a mitochondrial cytopathy, and with CADASIL (cerebral autosomal dominant angiopathy with subcortical infarcts and leukoencephalopathy), a genetically determined disease of small vessels in the brain. The headache attacks in these disorders are indistinguishable from those of primary, true migraine, but other symptoms and disease features are also present. The causes of tension-type headache are still poorly understood. A combination of muscular factors, abnormal pain-perception mechanisms, and central emotional abnormalities exist, all possibly linked to brain-stem serotonergic interneurons. Furthermore, central and peripheral sensitization is involved. Contrary to common belief, the relevance of muscle contraction itself is marginal, especially in the chronic form. Because of their frequency, posttraumatic headaches should be mentioned. The acute phase usually is not a significant concern, because it does not change the initial assessment or management; this headache phase usually is considered nociceptive. Later, however, it can become a chronic, lingering head pain. This syndrome is variably associated with autonomic symptoms and is often akin to a primary headache syndrome, such as migraine and tension-type headache. It is believed that the trauma has acted as a trigger or exacerbating factor in the genesis of that primary headache. Frequently, psychological disturbances are present and need to be specifically addressed for therapeutic success. Often suspected but rarely implied, sinusitis should be excluded as the cause of headache, although acute sinusitis typically presents with systemic and otorhinolaryngologic (ORL) symptoms and signs. Chronic and allergic sinusitis are almost never responsible for headaches. Benign intracranial hypertension (pseudotumor cerebri) is caused by the expansion of one or more of the intracranial fluid spaces, such as the vasculature, the extracellular fluid compartment, or the cerebrospinal fluid (CSF) space. Several drugs, such as tetracycline, minocycline, penicillin, gentamicin, oral contraceptives, steroids, indomethacin, thyroid hormone, and lithium carbonate, may be inciting agents. Headache related to meningeal irritation may be caused by infection (meningitis), inflammation (eg, from a tumor), or hemorrhage (eg, from vascular malformation or malignant hypertension). Throughout the medical literature, estimates of overall frequency of headache in children vary among authors. Secondary headaches are the ones that are most frequently encountered before age 5 years. Migraine headache can occur as early as a few months of age. (A higher prevalence of migraine seems to exist in city dwellers.) Chronic tension-type headache occurs in 0.9% of 15 year-olds. In a widely cited study, Bille analyzed a questionnaire of 8993 children aged 7-15 years in the city of Uppsala in Sweden and found that 59% had suffered headache at some time in their life. [15, 16] In a systematic questionnaire of 2941 children, Sillanpaa found the prevalence of headache to be 37% at age 7 years, increasing to 69% by 14 years; migraine accounted for 2.7% and 10.6% of these headaches, respectively. Starfield screened 2500 children and found that 11% experienced chronic morbidity; among those children, about 20% had headache, with roughly one half of these children having migraine. No specific report exists regarding differential incidence of headache by race in children, but migraine frequency in adults in the US declines from whites to African-Americans to Asians. Approximately 60% of all children with migraines before puberty are male. Thereafter, the relationship is inversed, with 3 times more female than male migraineurs in adulthood. Other headache types are distributed more evenly. Long-term prognostic studies of pediatric headache are scarce, but Brna et al reported that at 20-year follow-up, 73% of pediatric headache patients in their study continued to suffer from headache. In a follow-up study of 200 patients from a headache clinic over 6 years, 48% of initial migraineurs remained migraine sufferers; 26% became tension-type headache sufferers; and 26% became headache-free. Similar numbers were observed for initial tension-type headache sufferers but with a slightly higher headache-free rate (41% remained with tension-type headache; 21% developed migraine; and 38% became headache-free). Clinical remission - Some migraine sufferers may become symptom-free over prolonged periods. Partial clinical remission - In others, migraines get less severe over time, resembling common migraine or tension-type headaches. Clinical persistence - The frequency and severity of migraine headache does not improve but does not get worse either. No mortality is associated with primary headaches, and that associated with secondary headaches depends purely on the underlying cause. Reports have indicated a higher incidence of ataxia associated with migraine, whether clinical or subclinical during provocation tests. These reports could correlate with white matter lesions on magnetic resonance imaging (MRI), especially in the cerebellum. Reassure the parents and the patient that the headache process is benign and not progressive. Review with them the headache pattern; associated symptoms such as nausea, dizziness, and photophobia; and the benign nature of the physical examination (including funduscopy). An imaging study can be reassuring to the family. This simple, but crucial, review will help to alleviate stress and worry, which may contribute to the patient's symptoms and the anxiety of the parents. Realizing that the pain, although unpleasant, is not life-threatening often allows the patient and parents to apply healthier coping strategies. Parents and patients need to be aware that migraine headaches may be a lifelong condition and that they should expect that the headaches will reappear at some time during the patient’s lifetime, especially during situations of increased stress such as puberty, marriage, or change of job. Reinforcing good health hygiene is another important educational step; sleep hygiene is particularly required. For patient education information, see the Headache and Migraine Center, as well as Causes and Treatments of Migraine and Related Headaches; Migraine Headache in Children; Migraine Headaches, Vision Effects; and Migraine and Cluster Headache Medications. Chakravarty A, Mukherjee A, Roy D. Migraine pain location: how do children differ from adults?. J Headache Pain. 2008 Dec. 9(6):375-9. [Medline]. Headache Classification Subcommittee of the International Headache Society. The International Classification of Headache Disorders: 2nd edition. Cephalalgia. 2004. 24 Suppl 1:9-160. [Medline]. Hämäläinen ML, Hoppu K, Santavuori PR. Effect of age on the fulfilment of the IHS criteria for migraine in children at a headache clinic. Cephalalgia. 1995 Oct. 15(5):404-9. [Medline]. Headache Classification Committee of the IHS. Classification and diagnostic criteria for headache disorders, cranial neuralgias and facial pain. Headache Classification Committee of the International Headache Society. Cephalalgia. 1988. 8 Suppl 7:1-96. [Medline]. Lima MM, Padula NA, Santos LC, Oliveira LD, Agapejev S, Padovani C. Critical analysis of the international classification of headache disorders diagnostic criteria (ICHD I-1988) and (ICHD II-2004), for migraine in children and adolescents. Cephalalgia. 2005 Nov. 25(11):1042-7. [Medline]. Metshonkala L, Sillanpaa M. Classification of headache and migraine in children. Proceedings of the 3rd Congress on Headache in Childhood and Adolescence; Hungary, Budapest. Cephalalgia. May 1995. 15(S16):7.
International Headache Society Classification ICHD-II. March 23, 2012. [Full Text]. Hoffmann J. Recent advances in headache research. Expert Rev Neurother. 2011 Oct. 11(10):1379-81. [Medline]. Vanmolkot KR, Kors EE, Turk U, et al. Two de novo mutations in the Na,K-ATPase gene ATP1A2 associated with pure familial hemiplegic migraine. Eur J Hum Genet. 2006 May. 14(5):555-60. [Medline]. Dichgans M, Freilinger T, Eckstein G, Babini E, Lorenz-Depiereux B, Biskup S, et al. Mutation in the neuronal voltage-gated sodium channel SCN1A in familial hemiplegic migraine. Lancet. 2005 Jul 30-Aug 5. 366(9483):371-7. [Medline]. Ducros A, Joutel A, Vahedi K, Cecillon M, Ferreira A, Bernard E, et al. Mapping of a second locus for familial hemiplegic migraine to 1q21-q23 and evidence of further heterogeneity. Ann Neurol. 1997 Dec. 42(6):885-90. [Medline]. Gardner K, Barmada MM, Ptacek LJ, Hoffman EP. A new locus for hemiplegic migraine maps to chromosome 1q31. Neurology. 1997 Nov. 49(5):1231-8. [Medline]. Lateef TM, Merikangas KR, He J, Kalaydjian A, Khoromi S, Knight E, et al. Headache in a national sample of American children: prevalence and comorbidity. J Child Neurol. 2009 May. 24(5):536-43. [Medline]. [Full Text]. Raieli V, Eliseo M, Pandolfi E, La Vecchia M, La Franca G, Puma D, et al. Recurrent and chronic headaches in children below 6 years of age. J Headache Pain. 2005 Jun. 6(3):135-42. [Medline]. Bille B. Migraine in childhood. Lanzi G, Ballotin U, Cernibori A, eds. Headache in Children and Adolescents. Amsterdam: Elsevier Science Publishers; 1989. 19-26. BILLE BS. Migraine in school children. A study of the incidence and short-term prognosis, and a clinical, psychological and electroencephalographic comparison between children with migraine and matched controls. Acta Paediatr Suppl. 1962 May. 136:1-151. [Medline]. [Guideline] Lewis DW, Ashwal S, Dahl G, Dorbad D, Hirtz D, Prensky A, et al. Practice parameter: evaluation of children and adolescents with recurrent headaches: report of the Quality Standards Subcommittee of the American Academy of Neurology and the Practice Committee of the Child Neurology Society. Neurology. 2002 Aug 27. 59(4):490-8. [Medline]. Fendrich K, Venneman M, Pfaffenrath V, et al. Headache prevalence among adolescents- The German DMKG headache study. Cephalgia. 2007. 27:347-354. Lu SR, Fuh JL, Juang KD, Wang SJ. A student population-based study in Taiwan. Cephalgia. 2000. 20:479-485. Split W, Neuman W. Epidemiology of migraine among students from randomly selected secondary schools in Lodz. Headache. 1999 Jul-Aug. 39(7):494-501. [Medline]. Sillanpää M. Changes in the prevalence of migraine and other headaches during the first seven school years. Headache. 1983 Jan. 23(1):15-9. [Medline]. Sillanpää M. Prevalence of headache in prepuberty. Headache. 1983 Jan. 23(1):10-4. [Medline]. Mortimer MJ, Kay J, Jaron A. Childhood migraine in general practice: clinical features and characteristics. Cephalalgia. 1992 Aug. 12(4):238-43; discussion 186. [Medline]. Linet MS, Stewart WF, Celentano DD, Ziegler D, Sprecher M. An epidemiologic study of headache among adolescents and young adults. JAMA. 1989 Apr 21. 261(15):2211-6. [Medline]. Rothner AD. The migraine syndrome in children and adolescents. Pediatr Neurol. 1986 May-Jun. 2(3):121-6. [Medline]. Abu-Arefeh I, Russell G. Prevalence of headache and migraine in schoolchildren. BMJ. 1994 Sep 24. 309(6957):765-9. [Medline]. [Full Text]. Brna P, Dooley J, Gordon K, Dewan T. The prognosis of childhood headache: a 20-year follow-up. Arch Pediatr Adolesc Med. 2005 Dec. 159(12):1157-60. [Medline]. Powers SW, Patton SR, Hommel KA, Hershey AD. Quality of life in childhood migraines: clinical impact and comparison to other chronic illnesses. Pediatrics. 2003 Jul. 112(1 Pt 1):e1-5. [Medline]. Bigal ME, Lipton RB. The prognosis of migraine. Curr Opin Neurol. 2008 Jun. 21(3):301-8. [Medline]. Charles JA, Peterlin BL, Rapoport AM, Linder SL, Kabbouche MA, Sheftell FD. Favorable outcome of early treatment of new onset child and adolescent migraine-implications for disease modification. J Headache Pain. 2009 Aug. 10(4):227-33. [Medline]. Battistutta S, Aliverti R, Montico M, Zin R, Carrozzi M. Chronic tension-type headache in adolescents. Clinical and psychological characteristics analyzed through self- and parent-report questionnaires. J Pediatr Psychol. 2009 Aug. 34(7):697-706. [Medline]. Schürks M, Rist PM, Bigal ME, Buring JE, Lipton RB, Kurth T. Migraine and cardiovascular disease: systematic review and meta-analysis. BMJ. 2009 Oct 27. 339:b3914. [Medline]. [Full Text]. Hershey AD, Powers SW, Vockell AL, LeCates SL, Segers A, Kabbouche MA. Development of a patient-based grading scale for PedMIDAS. Cephalalgia. 2004 Oct. 24(10):844-9. [Medline]. Lowry F. New tool aids in diagnosis of pediatric migraine. Medscape Medical News. Jan 17, 2013. Available at http://www.medscape.com/viewarticle/777797. Accessed: January 22, 2013. Lateef T, Cui L, Heaton L, Nakamura EF, Ding J, Ahmed S, et al. Validation of a migraine interview for children and adolescents. Pediatrics. 2013 Jan. 131(1):e96-e102. [Medline]. [Full Text]. Cuvellier JC, Mars A, Vallée L. The prevalence of premonitory symptoms in paediatric migraine: a questionnaire study in 103 children and adolescents. Cephalalgia. 2009 Nov. 29(11):1197-201. [Medline]. Gelfand AA, Thomas KC, Goadsby PJ. Before the headache: Infant colic as an early life expression of migraine. Neurology. 2012 Sep 25. 79(13):1392-6. [Medline]. Wöber-Bingöl C, Wöber C, Karwautz A, Vesely C, Wagner-Ennsgraber C, Amminger GP, et al. Diagnosis of headache in childhood and adolescence: a study in 437 patients. Cephalalgia. 1995 Feb. 15(1):13-21; discussion 4. [Medline]. Osterhaus JT, Townsend RJ, Gandek B, Ware JE Jr. Measuring the functional status and well-being of patients with migraine headache. Headache. 1994 Jun. 34(6):337-43. [Medline]. Powers SW, Patton SR, Hommel KA, Hershey AD. Quality of life in paediatric migraine: characterization of age-related effects using PedsQL 4.0. Cephalalgia. 2004 Feb. 24(2):120-7. [Medline]. Chow AW, Benninger MS, Brook I, Brozek JL, Goldstein EJ, Hicks LA, et al. IDSA clinical practice guideline for acute bacterial rhinosinusitis in children and adults. Clin Infect Dis. 2012 Apr. 54(8):e72-e112. [Medline]. Graf WD, Kayyali HR, Alexander JJ, Simon SD, Morriss MC. Neuroimaging-use trends in nonacute pediatric headache before and after clinical practice parameters. Pediatrics. 2008 Nov. 122(5):e1001-5. [Medline]. [Guideline] Lewis D, Ashwal S, Hershey A, Hirtz D, Yonker M, Silberstein S. Practice parameter: pharmacological treatment of migraine headache in children and adolescents: report of the American Academy of Neurology Quality Standards Subcommittee and the Practice Committee of the Child Neurology Society. Neurology. 2004 Dec 28. 63(12):2215-24. [Medline]. Wöber C, Wöber-Bingöl C. Clinical management of young patients presenting with headache. Funct Neurol. 2000. 15 Suppl 3:89-105. [Medline]. Milde-Busch A, Blaschek A, Borggräfe I, Heinen F, Straube A, von Kries R. Associations of diet and lifestyle with headache in high-school students: results from a cross-sectional study. Headache. 2010 Jul. 50(7):1104-14. [Medline]. Winner P, Rothner AD, Wooten JD, Webster C, Ames M. Sumatriptan nasal spray in adolescent migraineurs: a randomized, double-blind, placebo-controlled, acute study. Headache. 2006 Feb. 46(2):212-22. [Medline]. Linder SL, Mathew NT, Cady RK, Finlayson G, Ishkanian G, Lewis DW. Efficacy and tolerability of almotriptan in adolescents: a randomized, double-blind, placebo-controlled trial. Headache. 2008 Oct. 48(9):1326-36. [Medline]. Fraser IP, Han L, Han TH, Li CC, Hreniuk D, Stoch SA, et al. Pharmacokinetics and tolerability of rizatriptan in pediatric migraineurs in a randomized study. Headache. 2012 Apr. 52(4):625-35. [Medline]. Ho TW, Pearlman E, Lewis D, Hämäläinen M, Connor K, Michelson D, et al. Efficacy and tolerability of rizatriptan in pediatric migraineurs: results from a randomized, double-blind, placebo-controlled trial using a novel adaptive enrichment design. Cephalalgia. 2012 Jul. 32(10):750-65. [Medline]. Anderson, P. FDA Okays Sumatriptan/Naproxen (Treximet) for Migraine in Teens. Medscape Medical News. Available at http://www.medscape.com/viewarticle/844752. Accessed: May 15, 2015. Pandina GJ, Ness S, Polverejan E, Yuen E, Eerdekens M, Bilder RM, et al. Cognitive effects of topiramate in migraine patients aged 12 through 17 years. Pediatr Neurol. 2010 Mar. 42(3):187-95. [Medline]. Borzy JC, Koch TK, Schimschock JR. Effectiveness of topiramate in the treatment of pediatric chronic daily headache. Pediatr Neurol. 2005 Nov. 33(5):314-6. [Medline]. Dodick DW, Silberstein S, Saper J, Freitag FG, Cady RK, Rapoport AM, et al. The impact of topiramate on health-related quality of life indicators in chronic migraine. Headache. 2007 Nov-Dec. 47(10):1398-408. [Medline]. Hershey AD, Gladstein J, Winner P. Chronic daily headache in the pediatric population. Curr Treat Options Neurol. 2007 Jan. 9(1):14-22. [Medline]. Powers SW, Coffey CS, Chamberlin LA, et al for the CHAMP Investigators. Trial of amitriptilyne, topiramate, and placebo for pediatric migraine. New Eng J Med. Online First. October 27, 2016. Termine C, Ferri M, Balottin U. Acute treatment of migraine in children and adolescents. Funct Neurol. 2008 Apr-Jun. 23(2):63-9. [Medline]. Bailey B, McManus BC. Treatment of children with migraine in the emergency department: a qualitative systematic review. Pediatr Emerg Care. 2008 May. 24(5):321-30. [Medline]. Walker DM, Teach SJ. Emergency department treatment of primary headaches in children and adolescents. Curr Opin Pediatr. 2008 Jun. 20(3):248-54. [Medline]. Boyle R, Behan PO, Sutton JA. A correlation between severity of migraine and delayed gastric emptying measured by an epigastric impedance method. Br J Clin Pharmacol. 1990 Sep. 30(3):405-9. [Medline]. [Full Text]. Hämäläinen ML, Hoppu K, Valkeila E, Santavuori P. Ibuprofen or acetaminophen for the acute treatment of migraine in children: a double-blind, randomized, placebo-controlled, crossover study. Neurology. 1997 Jan. 48(1):103-7. [Medline]. Visser WH, Winner P, Strohmaier K, Klipfel M, Peng Y, McCarroll K, et al. Rizatriptan 5 mg for the acute treatment of migraine in adolescents: results from a double-blind, single-attack study and two open-label, multiple-attack studies. Headache. 2004 Oct. 44(9):891-9. [Medline]. Winner P, Lewis D, Visser WH, Jiang K, Ahrens S, Evans JK. Rizatriptan 5 mg for the acute treatment of migraine in adolescents: a randomized, double-blind, placebo-controlled study. Headache. 2002 Jan. 42(1):49-55. [Medline]. Hewitt DJ, Pearlman E, Hämäläinen M, Lewis D, Connor KM, Michelson D, et al. Long-Term Open-Label Safety Study of Rizatriptan Acute Treatment in Pediatric Migraineurs. Headache. 2012 Oct 18. [Medline]. Anderson P. Gum chewing in lids under-recognized cause of headaches. Medscape Medical News. January 17, 2014. [Full Text]. Watemberg N, Matar M, Har-Gil M, Mahajnah M. The influence of excessive chewing gum use on headache frequency and severity among adolescents. Pediatr Neurol. 2014 Jan. 50(1):69-72. [Medline]. Disclosure: Received research grant from: Allergan. Disclosure: Received consulting fee from Zogenix for board membership; Received consulting fee from MAPP for review panel membership; Received grant/research funds from GlaxoSmithKline for research investigator; Received consulting fee from Allergan for board membership; Received consulting fee from Allergan for consulting.